Background: A new nanomaterial species called “graphene” has been of great interest owing to its outstanding mechanical, thermal, chemistry, and physical characteristics. The etching either directly from chemical vapor deposition growth process or plasma technology process has been emerging as attracting research topic in achieving the thinner graphene layer and cleaner surface in order to improve their electronics and optoelectronics. The resided impurities and the high roughness surface are because of the nature of graphenes induced in deteriorating the performance. Removal of the impurities by surface cleaning or plasma-related graphene etching through the layer-by-layer thinning method as a top-down lithography. In particular, new plasma-based graphene etching is freedamage while maintaining its π-binding, which affects its conductivity. Objective: This mini-review will address the latest progress related to graphene etching technology based on emerging strategies. From here, it might be adopted in the etching of other nanomaterials. Keywords: Atomic layer etching (ALE), chemical vapor deposition (CVD), graphene etching, inductively coupled plasma (ICP), ion beam, neutral beam, plasma, reactive ion etching (RIE). 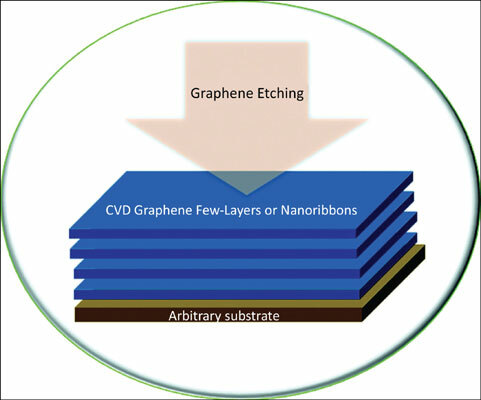 Title:Graphene Etching: How Could It Be Etched? Keywords:Atomic layer etching (ALE), chemical vapor deposition (CVD), graphene etching, inductively coupled plasma (ICP), ion beam, neutral beam, plasma, reactive ion etching (RIE). Abstract:Background: A new nanomaterial species called “graphene” has been of great interest owing to its outstanding mechanical, thermal, chemistry, and physical characteristics. The etching either directly from chemical vapor deposition growth process or plasma technology process has been emerging as attracting research topic in achieving the thinner graphene layer and cleaner surface in order to improve their electronics and optoelectronics. The resided impurities and the high roughness surface are because of the nature of graphenes induced in deteriorating the performance. Removal of the impurities by surface cleaning or plasma-related graphene etching through the layer-by-layer thinning method as a top-down lithography. In particular, new plasma-based graphene etching is freedamage while maintaining its π-binding, which affects its conductivity.